Profile: The Insecticon Virulent Clones were the result of Deathsaurus' resurrection of the latent Insecticon cloning capability. 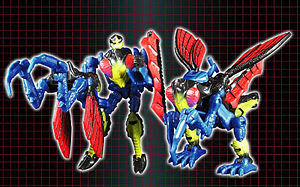 Extracted from the Cybertronian genetic codes of Buzzclaw and Dirge, the Insecticon clones were created to act as a self-replicating source of warriors for the Decepticon army. Each has a very rudimentary intelligence with no personality of its own. This makes them ideal for swarming enemies, with little regard for their own safety. The Clones listen to the Insecticon masters, Buzzclaw and Dirge, and will follow their orders to the letter at all times. Abilities: The claws and mandibles of each clone secrete acid, which helps them tear into enemy armor. The Clones are capable of comsuming almost any material to convert into energy to sustain their systems. In robot mode, each Clone carries that can absorb energy from an enemy's attack and redirect it back at them. They can use their wrist mounted claws as slashing weapons, and each has a basic level of hand-to-hand combat knowledge based on memory implants from Buzzclaw. Weakness: The exo-structure of the Clones are not as strong as those of Buzzclaw and Dirge. Thus the Clones are easily destroyed. It is their massive number, which serves as their greatest advantage.